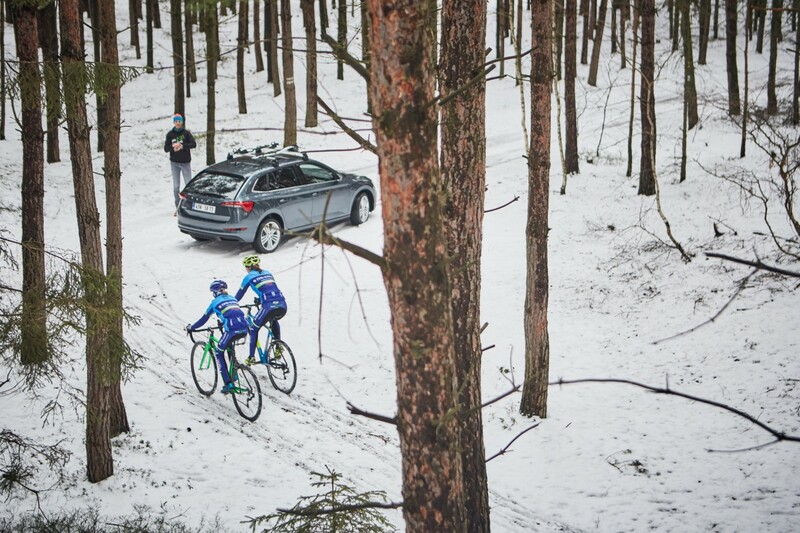 Czech cyclocross prospects drove to their training session in a ŠKODA SCALA. Despite its size, this car has a lot to offer to cyclists. What does Czech national team coach Petr Dlask think about the new ŠKODA model? Birds have come to a standstill, squirrels are turning their heads around. The triangular headlights are sending beams of light across tree trunks, as the ŠKODA SCALA, carrying a crew of athletes, weaves its way through a wide forest path – quite unusual for this type of car – near the Central Bohemian village of Branžež in the vicinity of the Komárovský pond. Czech cyclocross national team coach Petr Dlask (42) is at the wheel, two young prospects, Kristýna and Vanda, are sitting in the backseat, and the rack in the rear is carrying two race bikes. “Never mind the weather, you can never skip training,” says the coach, a five-time champion of the Czech Republic, who won second place in the World Championships 2001. The SCALA is a compact hatchback, but it can take in more than its exterior suggests. The boot is full of training essentials. It carries helmets, cycling shoes, jerseys, a warm change of clothes, a thermos flask with tea, sports drinks, bars, spare tyres, tool boxes, and a bicycle pump. Sometimes even relatively small things can do great things, and the SCALA proves this to be true. “At 197 centimetres, I was the tallest World Championships racer, but in the SCALA I can move my seat way to the back, and there’s still plenty of space behind me,” says Petr Dlask, who has a personal relationship to the manufacturer of ŠKODA cars, which is based in Mladá Boleslav. Petr comes from Mladá Boleslav, he trains the local team and lives in the town with his family. “Following the example of the local rally, I adjust my seat to the lowest position possible to be able to feel if the car is losing grip when cornering,” Petr describes his driving preferences with a smile. What he likes about the SCALA, which exceeds the RAPID in terms of size, is the multifunctional touch display in the middle of the dashboard. 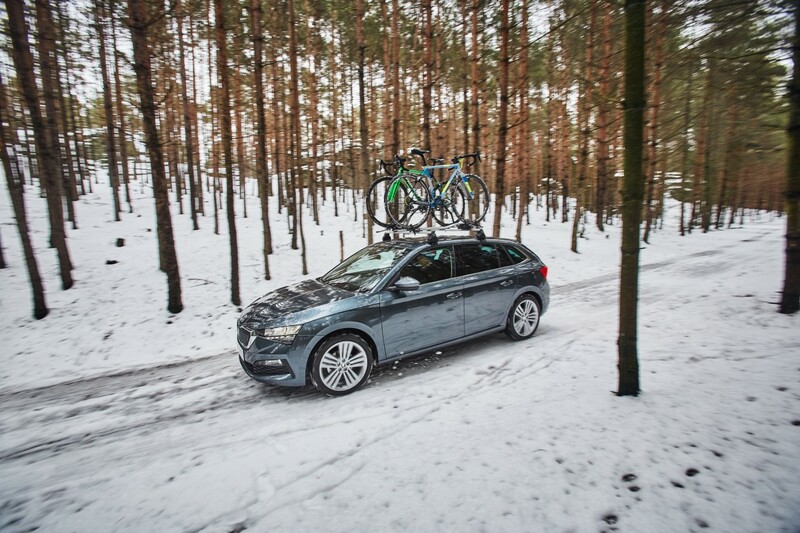 As an active cyclist, however, Petr is even more excited about other smart solutions the car is bursting with. The handiest of them, a retractable tow bar, can be unfolded under the rear bumper with a single touch of a button in the boot. While other cars either have a tow bar or not, the SCALA offers it when you need it (and doesn’t bother you with it in urban traffic where the car is in its element). “Of course you can have bikes on a roof rack, but I prefer a bike carrier on the tow bar,” says Petr and adds that it’s much easier to mount bikes on it, plus the lower drag of the rear bike carrier saves fuel. The cabin is nicely hushed, the 1.5 TSI turbocharged petrol engine with direct injection runs quietly as a mouse. 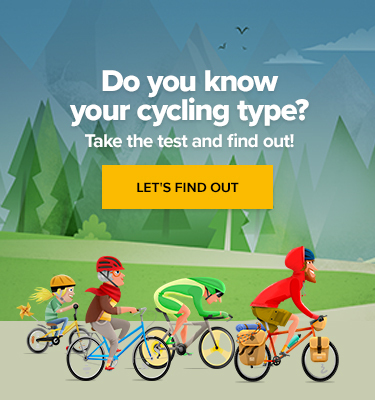 You can choose between the Normal, Sport, Eco and Individual modes, but as we are in the woods, it doesn’t really matter. Even though the road is crisscrossed with tree roots covered with snow, the big wheels on aluminium rims don’t transmit any unpleasant vibrations to the passengers. Petr parks the car on a small clearing in the middle of the forest, which will serve as a perfect starting point for the training. 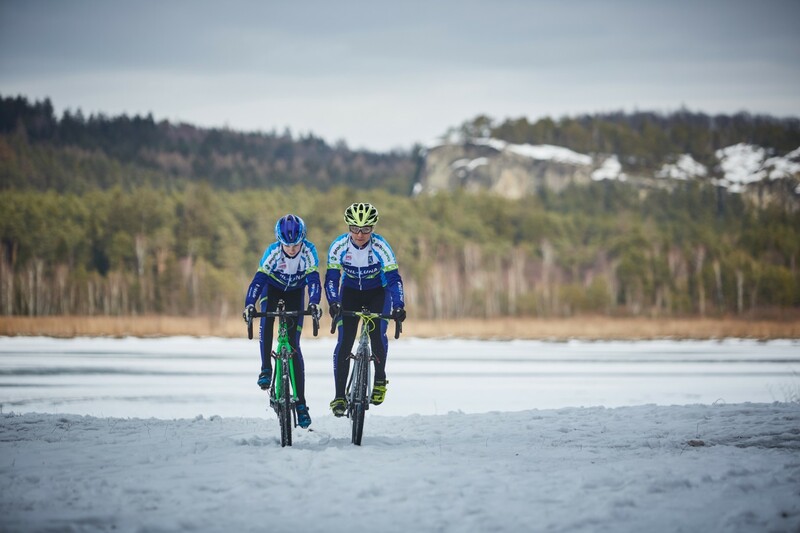 He has 18 charges aged 8 to 20 in his home team TJ Auto Škoda Mladá Boleslav, but today he has prepared a programme for girls who do cyclocross, one of the hardest cycling disciplines. “Cyclocross is not for sissies. This sport is unforgiving, but they’ll be tough girls,” says Petr in praise of his daughter Vanda (13) and her friend Kristýna Zemanová (15). Petr points out that his daughter is clearly influenced by he fact that she was born on the Aries – Taurus cusp. Vanda is thin, tall and looks fragile, but in fact, she’s stubborn and unyielding. She knows how to follow her goals and, just like her father, enjoys mud riding. While other girls give muddles a wide berth, Vanda rides through hundreds of them in one training session. Her older friend Kristýna has been doing sports since she was a child. Having exchanged athletics for cycling, she has already won some precious trophies. 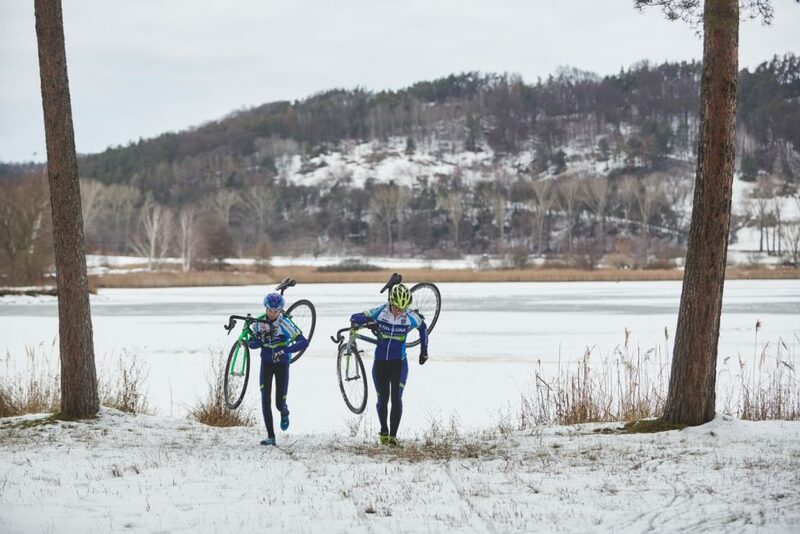 She has twice become the cyclocross champion of the Czech Republic in her age category. Just like most Petr’s charges, she too does mountain biking in the summer. “Last year I took third place at the national championships,” Kristýna says with modesty. But this is no time for talking. Girls quickly change into their kits, have a short warm-up and then hop on their carbon-framed bikes. 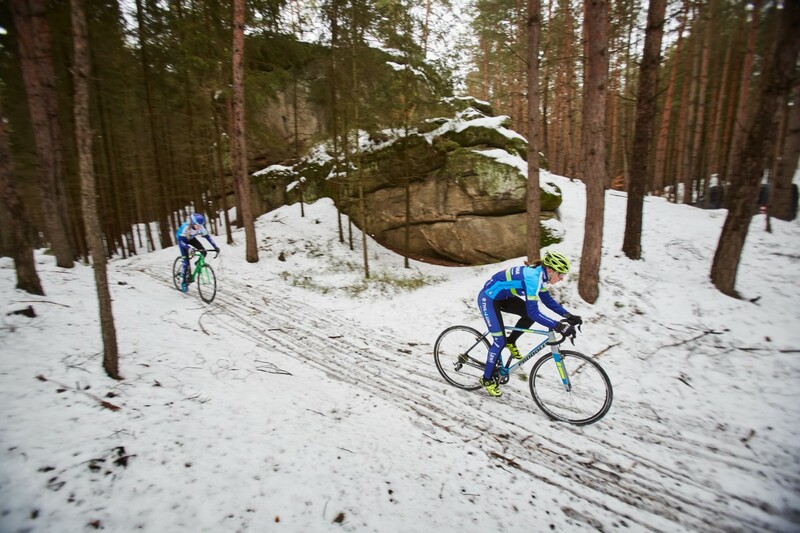 “Go, go!” Petr Dlask cheers the young racers, who pedal like crazy in the snow mixed with mud, sand, and leaves. 20 minutes into the training, and one thing is for sure: even though the girls may have been cold in the beginning, now they are sweating buckets. Next up are run-ups and getting on and off the bike, the essentials of cyclocross. Each training session is scheduled to take 50 to 60 minutes, and the girls go through all situations they may encounter during the 20 to 25-minute-long race. As coordination and dynamics develop primarily till the age of fifteen, it is important to lay the foundations early on. “If you start later, it’s hard. It’s more painful, and you have to be really gifted,” Petr explains, adding that it’s best to ride regularly, every day if possible. Part of the preparation is dedicated to jumping over obstacles, or bunny hop. Not long ago, this manoeuvre was the sole domain of pros, but today even kids learn how to jump on bike. It’s a good example of evolution, which can be avoided neither in sports, nor in automotive industry. What used to be included only in high-class cars is now affordable for drivers from the general public. The ŠKODA SCALA has features that aim to improve safety of cyclists in the streets, among other things. The principal tool is a modern radar that monitors not only cars in other lanes, but also cyclists approaching the parked car from behind. Thus, it helps to prevent a dangerous threat in today’s cities – dooring. Dooring is when a driver fails to notice an approaching cyclist and opens the door in the trajectory of their ride. If this happens, the cyclist has minimum amount of time and space to dodge it, and a collision with the door can be fatal for them. If an approaching cyclist is doing at least 16 km/h, the radar will detect them and the lights on the A pillars will start flashing to make the driver aware of the cyclist. Cyclists can also benefit from the adaptive cruise control, which automatically slows down the car if the SCALA catches up with another vehicle, but it can also detect a cyclist. Kristýna and Vanda are coming back from their final lap, and still out of breath get off their bikes. Because they are carrying helmets and bidons, they use another feature to open the boot – all they have to do is wave their foot on the right side under the rear bumper, and the SCALA opens the door on its own. This useful thing comes in handy not only after a training session, but also when you are loaded with shopping bags. All cyclists get in the car and leave for the town. But they won’t rest long. The season is full on, and training is crucial.